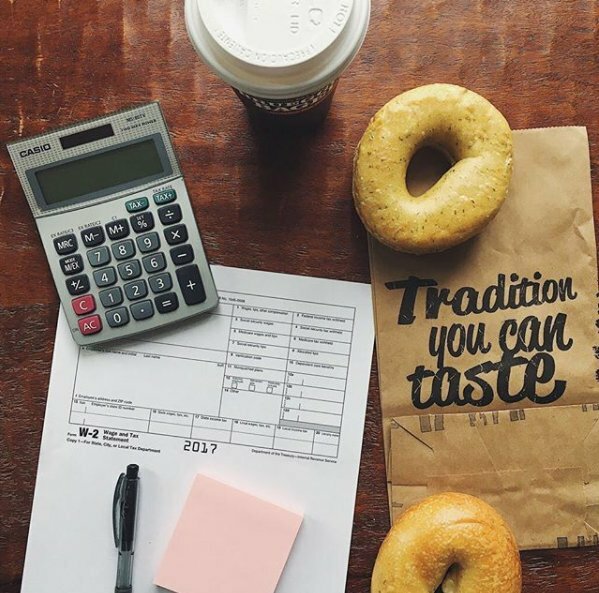 DENVER (March 28, 2019) – Tax time can be stressful for many filers, but there’s one “deduction” they can count on this year: at least $3.50 off a delicious Big Bagel Bundle at Bruegger’s Bagels from April 10-15. The Big Bagel Bundle, which combines the guest’s choice of 13 small-batch New York-style bagels with two tubs of cream cheese, is available all year long, but from April 10-15 the price is just $10.40 at participating bakeries. Any guest who is a member of the Bruegger’s Inner Circle or who claims the offer at Brueggers.com can receive this tasty tax relief offer. Guests can also join the Bruegger’s Inner Circle to receive a free bagel with cream cheese, as well as 2 points for every $1 spent year-round to redeem for their favorite menu items. Guests can join at Brueggers.com or by downloading the app. Facebook, Twitter and Instagram, and join the Inner Circle at brueggers.com to receive news and special offers.